After a high octane, history smashing, character driven opening two-parter, Doctor Who went retro tonight. Following on from The Magician's Apprentice and The Witch's Familiar is a bloody difficult task, but writer Toby Whithouse really pulled it out of the bag for this one. This was classic, old school Doctor Who. Both a ghost story and a base under siege story at once, opening with the TARDIS materialising somewhere for the Doctor and Clara to go exploring. The premise of Under the Lake is Doctor Who at its most effectively simple, but as the episode progresses Whithouse keeps things feeling fresh and exciting despite the episode's countless comparisons to other stories. Under the Lake does, after all, feel like a mashup of 2006's The Impossible Planet, 2007's 42, 2009's The Waters of Mars and 2013's Hide. But it's a near perfect encapsulation of what works best in each of these episodes. Under the Lake may not be the most groundbreakingly original story the show has put out in recent years, but it's one of the scariest, most atmospheric outings in a long time. We can get the gripes out of the way first. Again, much like The Magician's Apprentice, this episode makes use of a cliffhanger involving the "death" of one of the show's lead characters. 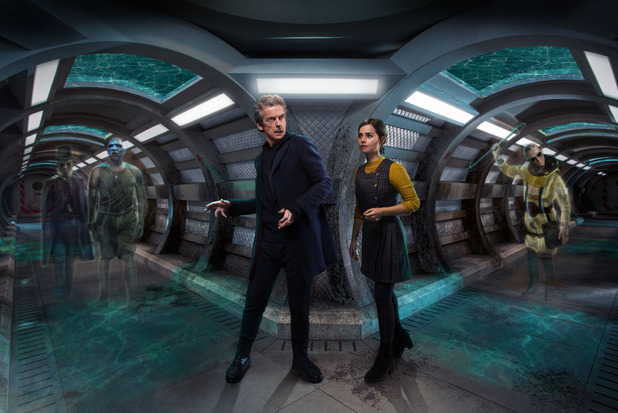 Whilst the series opener left Clara's fate "in the balance", Under the Lake tells us that the Doctor will die at some point next week and uses it as the episode's big jaw dropping conclusion. It works well for an initial shock, that sight of the ghost Doctor floating towards Clara in the murky lake won't be leaving my mind any time soon, but there's no real weight to it. We know the Doctor won't die, so why leave it as the supposed cliffhanger? Although, part of me does disagree with that criticism. It's a cliffhanger that, while obviously a narrative trick, does set up a hell of a lot of fun with the whole "How did he do it?" thing for next week's episode. It's fun, but it's cheap. The Doctor will not die next week. Clara will also not die on the base along with Cass and Lunn. But Doctor Who isn't just about end games, it's also about the bits in between. As long as next week's Before the Flood makes the story work and finds a genuine reason for the Doctor to "die", I will heartily take back this criticism. But it says a lot about my feelings for Under the Lake that I'm debating myself as to whether my one real issue with the episode is actually an issue. This was a fantastic outing for the show, and one that proves how good Doctor Who can still be when it isn't being explosive and game changing, but simply tells a compelling sci-fi/horror story. Unlike a lot of part ones, Under the Lake never feels short on narrative supply. Act one perfectly introduces us to the characters and the situation, act two ramps up the action while allowing us to learn more about the ghosts and their history, and the third act brings everything to an intense conclusion whilst still furthering the narrative. While other part ones can feel as if they're telling twenty minutes of story across a 45 minute time frame, Whithouse packed this episode with exciting plot developments, but holds enough back to allow us to head into Before the Flood with a genuine sense of mystery. It's one of the most effective narrative setups for a two-parter this show has done in a very long time. Under the Lake is also home to some refreshing and, really, stunning cinematography and visual design from the offset. It's clear that the show has been granted a bigger budget this year by the quality of the special effects alone. The ghosts are superbly realised, while other monsters can be weakened by their bad visual design (I'm looking at you, Mr Lazarus) these ghosts are a simple and scary sight to behold. Doctor Who's knack for running down corridors also flourished tonight, but was strengthened by some pretty impressive set design. The bluey-green tinge that floods the frame during daylight gives the episode a unique visual flare, while the darker, orangey-brown lighting creates a perfect sense of dread when the episode heads into nighttime. Director Daniel O'Hara has real fun with making the wonderful sets and lighting he's been given into something genuinely unsettling, and he frames the episode accordingly. The corridors are mostly staged with the camera dead central, creating an eerily symmetrical feel to the underwater base, while leaving darkened windows and looming shadows on the outskirts and in the background. As my eyes darted around the frame in suspense, I couldn't help but think this was the show's most visually impressive episode since Listen. Under the Lake works wonders for this show, especially coming directly after that Earth-shattering series opener. It proves that Doctor Who doesn't always have to go big to do well. This is a premise that could fit in any series of the show, from William Hartnell through to Peter Capaldi the whole "ghosts in an underwater base" could work for anyone, and it's told accordingly. But it's the relationship between the Doctor and Clara that mean the actual episode feels appropriately placed here and now. Clara's over excitement to do something dangerous concerns the Doctor, and it's nice to see this. After his sometimes annoyingly stern approach to the character last year, Capaldi can now feel slightly more human, while still retaining his typical alien-ness. The cue cards for when he doesn't know how to empathise with people were a great touch, and arguably the episode's funniest moment. If Before the Flood, which is partially set a few hundred years before this episode, can keep this atmosphere and momentum rolling - which I wholeheartedly believe it can - then I might start believing that this could be the show's best series yet. I know I only mentioned it a few sentences ago, but the cue card joke really was great. There was also a nice callback to good old Sarah Jane Smith, with one card reading "I'm sorry, I should have known you didn't live in Aberdeen". This episode was written by the same man who wrote the rather brilliant School Reunion from 2007, so it's no surprise Sarah Jane got a reference. The Doctor's references to Shirley Bassey and Peter Andre were also funny, the former more so than the latter. I ran out of time to discuss them in the episode so I'll do it here now. The supporting cast for this episode were excellent, each member gave assured performances that strengthened their solid characterisation. Particularly impressive were Sophie Stone as Cass and Zaqi Ismail as Lunn. Cass' deafness was molded into the episode nicely, never feeling like it only existed for the sake of it but cleverly used to advance the story, and Ismail's delivery of his sign language reading was seamless. It doesn't look like the Sonic Sunglasses are going anywhere soon. It'll be nice for the show to to have a break from the whole "Sonic Screwdriver solves everything" trope, but they're just not quite the same, are they? This episode featured a language untranslatable by the TARDIS, psychic paper, a deadlock seal and the TARDIS cloister bell, just in case you needed any more proof that this was Doctor Who gone old school. "Death was the one thing that unified every single living creature in the universe, and now it's gone".